Posh players celebrate Oli Shackleton's goal against Luton in the FA Youth Cup. Photo: Joe Dent/theposh.com. Peterborough United strolled into the third round of the FA Youth Cup with a convincing 3-0 win over Luton Town at the ABAX Stadium tonight (November 6). Goals from Oli Shackleton, Mikkel Fosu and Luton defender Duquane Wilson-Braithwaite ensured Posh gained ample revenge for a 5-1 home defeat at the hands of the young Hatters at the weekend. Posh were a different beast tonight and thoroughly deserved their margin of victory. Harrison Burrows in action for Posh against Luton in the FA Youth Cup. Photo: Joe Dent/theposh.com. Matthew Etherington’s side bossed the first half, without creating too much, but took the lead through Shackleton’s well drilled finish in the 31st minute. A horrible pass from a visiting player presented Jack Gurney with the ball in the Luton penalty area. He slipped the ball to Shackleton who finished well past Luton ‘keeper Tieran Parker. Parker had saved a Gurney long shot a few minutes earlier as Posh probed relentlessly for openings. Gurney was prominent throughout, revelling in the space a rather disappointing Luton side gave him. Mikkel Fosu makes it 3-0 to Posh against Luton in the FA Youth Cup. Photo: Joe Dent/theposh.com. Flynn Clarke had sent a fizzing 25 yarder narrowly wide in the opening moments as Posh took control from the first kick-off, even though star man Harrison Burrows, the midfielder first-team boss Steve Evans wanted to play at Portsmouth in the last League One game of last season, was quiet. The Posh goal did prompt Luton to inject more urgency into their game, but an apparent unfamiliarity with the offside law usually stopped them in their tracks. Josh Boorn shot wide from their best opportunity. Posh almost made it 2-0 three minutes before the interval when a free kick from out wide caused chaos in the Luton penalty area. Left-back Fosu stabbed wide when the ball broke to him. Luton had to improve after the break and they did, striking the crossbar through Corey Panter after a clever free kick routine in the 55th minute. But Posh were soon back on top. Gurney curled wide from 25 yards before Ricky Jade-Jones missed a glorious chance to claim a second Posh goal, shooting wide after outstripping the Luton defence. But Posh were not to be denied for long. In the 65th minute centre-back Frazer Garner headed a free kick back across goal and watched Luton centre-back Wilson-Braithwaite chest past his own ‘keeper. Burrows sprang into life 10 minutes from time after fine work from Shackleton, but his first time shot was well saved. 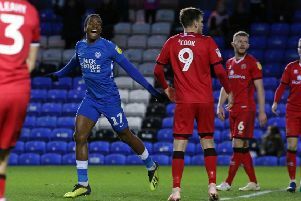 Posh made sure of their third round spot when Fosu slammed home a loose ball following a free kick in the 86th minute. Posh: Will Blackmore, Rio Douglas, Mikkel Fosu, Kyle Barker, Frazer Garner, Archie Jones, Flynn Clarke (sub Brad Rolt, 82 mins) , Jack Gurney, Oliver Shackleton, Ricky Jade-Jones (sub Harry Brookes, 90 mins), Harrison Burrows (sub Luke Strachan, 86 mins). Unused substitutes: Josh Allen, Toby Salmon. Luton: Tieran Parker, Avan Jones, Corey Panter, Dequane Wilson-Braithwaite, Drew Richardson (sub Sam Beckwith, 53 mins), Jake Peck, Connor Tomlinson, Josh Neufville, Jonas Kalonda, Toby Byron, Josh Boorn (sub Tra Lucas, 65 mins). Unused substitutes: James Holden, Lewis Swindells, Coree Wilson. Posh - Shackleton (31 mins), Wilson-Braithwaite (og, 64 mins), Fosu (84 mins).